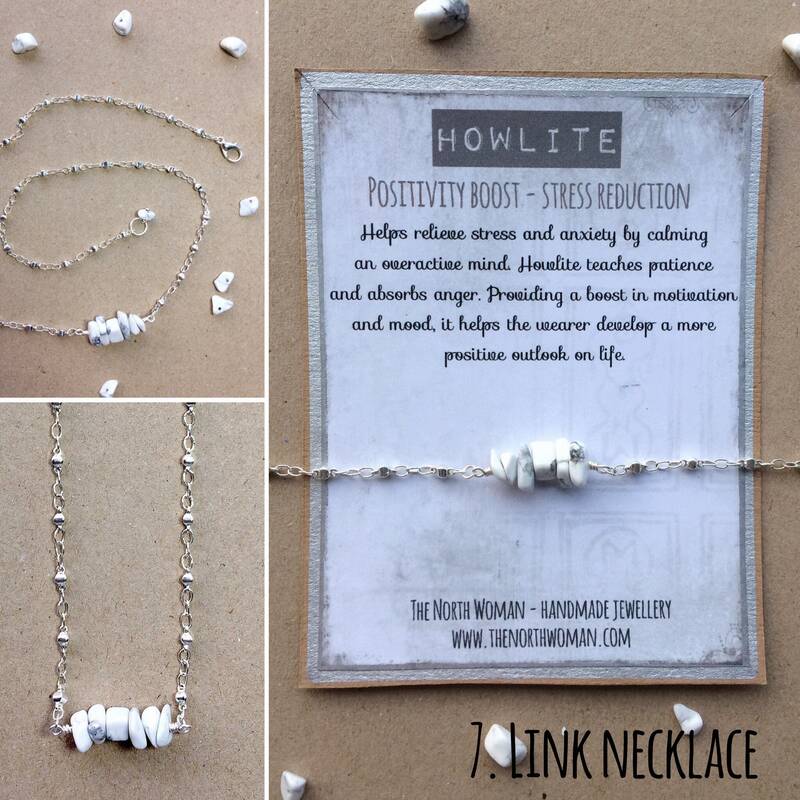 A collection of jewellery made with Howlite healing Gemstones for times of stress. 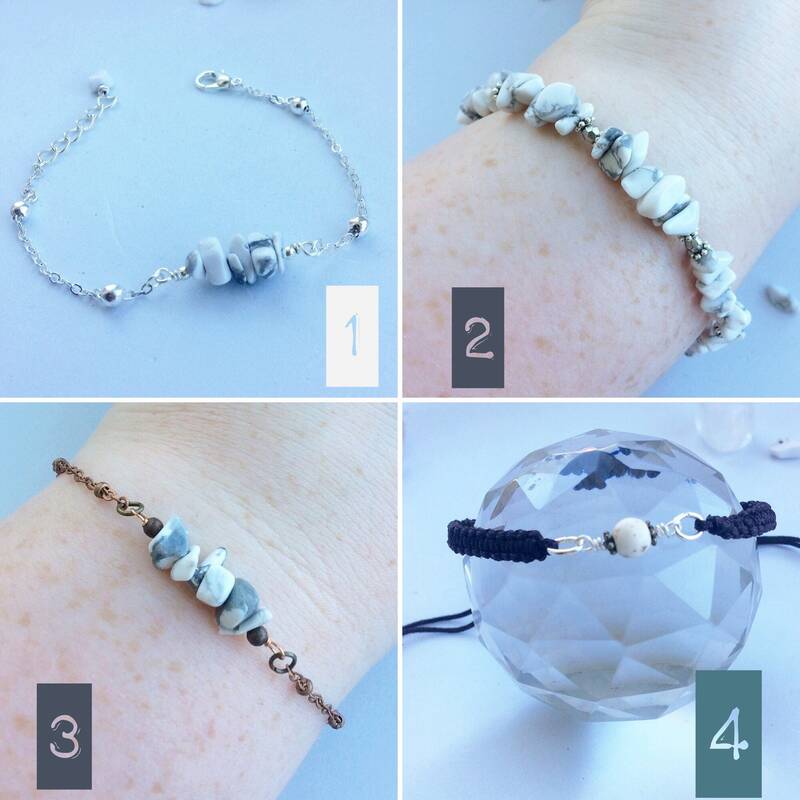 This includes a choice of 4 bracelets, 2 necklaces and 2 pairs of earrings. 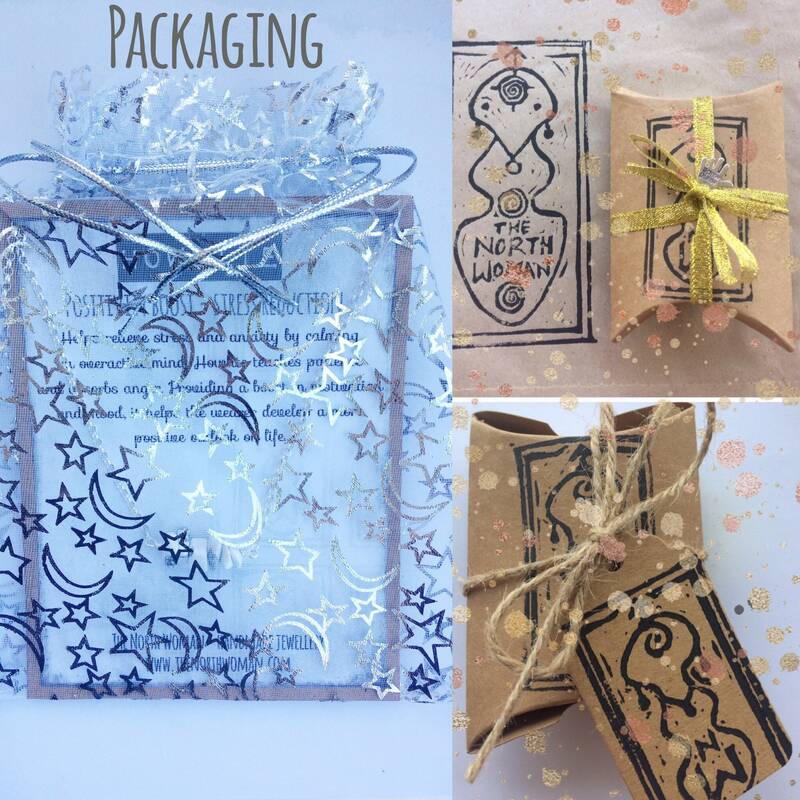 They are presented with the healing properties information card in either a organza ribbon gift bag or hand finished lino printed packaging. 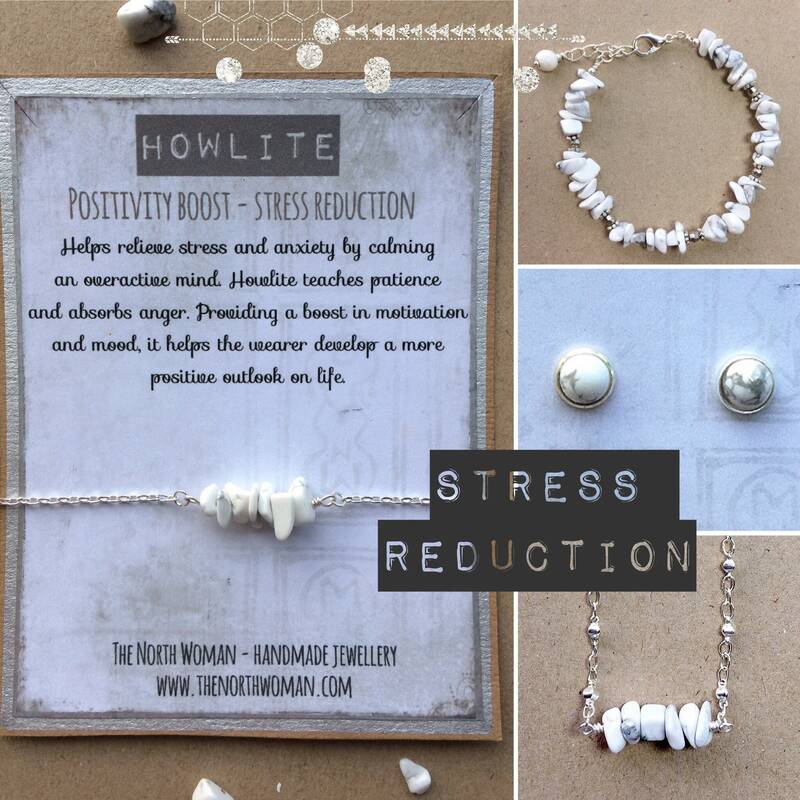 Howlite - Howlite helps relieve stress and anxiety by calming an overactive mind. It teaches patience and absorbs anger. Providing a boost in motivation and mood, it helps the wearer develop a more positive outlook on life. 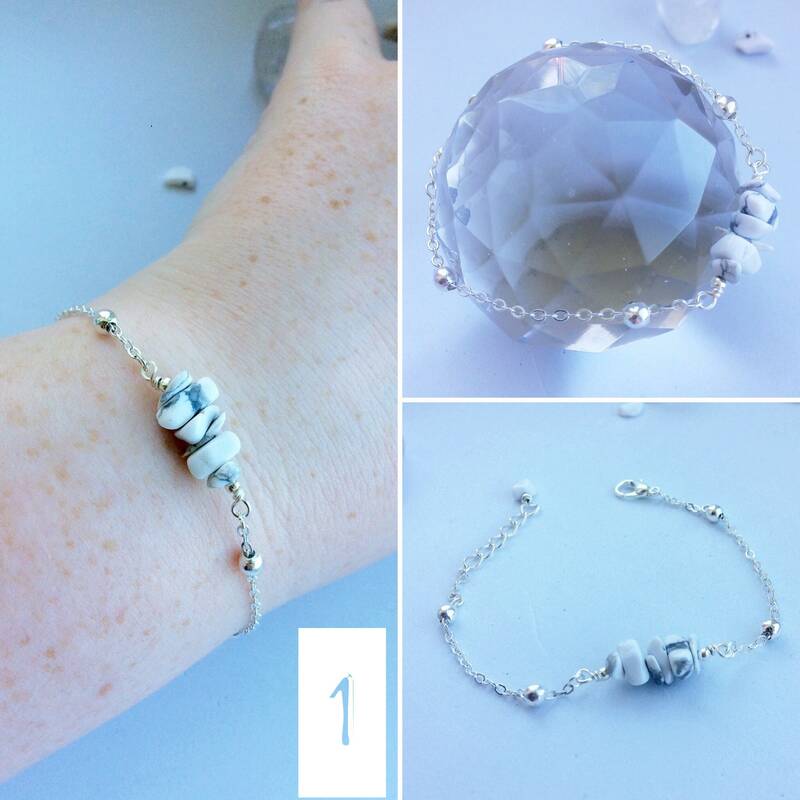 Bracelet 1 - Chain - Adjustable fit from 16-18cm (6.2"-7") with howlite gemstone chip beads on a silver plated chain. The chain is decorated with silver beads and finished with a lobster clasp. Adjustable fit with extender chain which has a matching howlite bead. A dainty, pretty, delicate design. Bracelet 2 - Gemstone - Adjustable fit from 14cm-16cm (5.5-6.2") with howlite gemstone chip beads, vintage silver coloured beads and vintage mixed metal beads with a extender chain with matching howlite gemstone bead. Closes with a silver coloured lobster clasp. 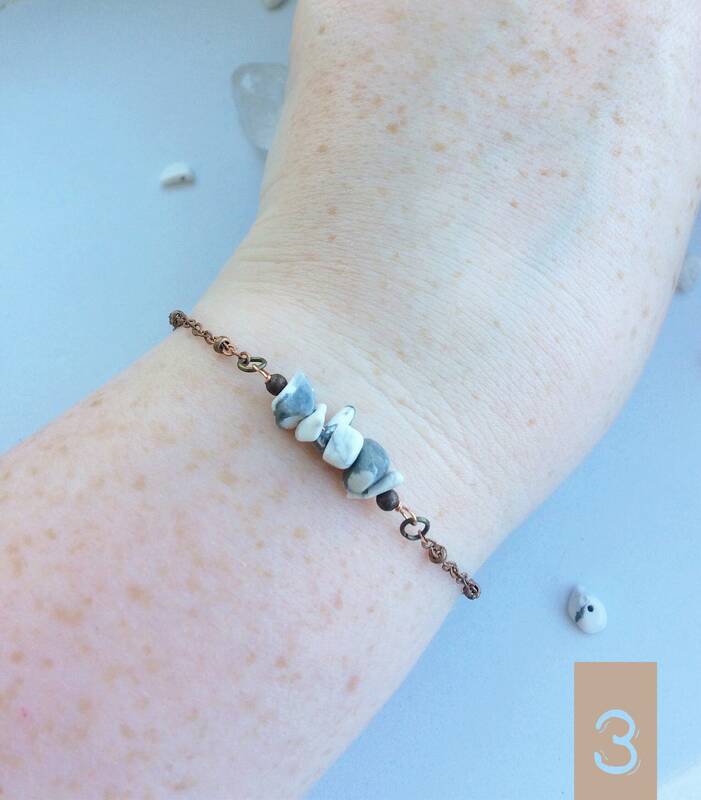 Bracelet 3 - Copper Chain - Adjustable fit from 18-22cm (7"-8.6") with howlite gemstone chip beads on a copper coloured chain which is decorated with small beads and finished with a rose gold lobster clasp. Adjustable fit with copper coloured extender chain which has a matching howlite bead. Bracelet 4 - Cord - Adjustable fit from 14cm. This unisex design uses adjustable nylon cord in a dark brown colour, about 4~6mm wide from 14cm long. This is adjustable by pulling on the strings, from a average ladies size to generous man's fit, each cord is finished with hematite beads. 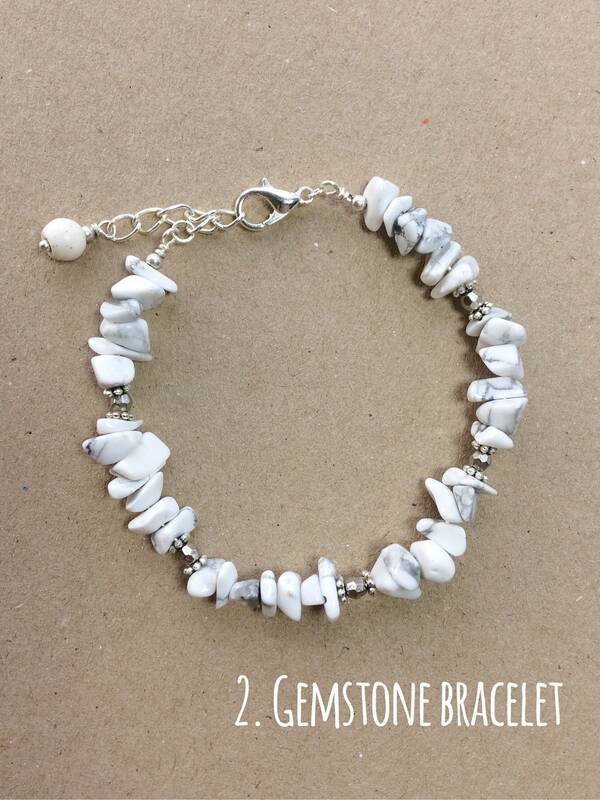 The bracelet features a single 5mm round howlite bead. 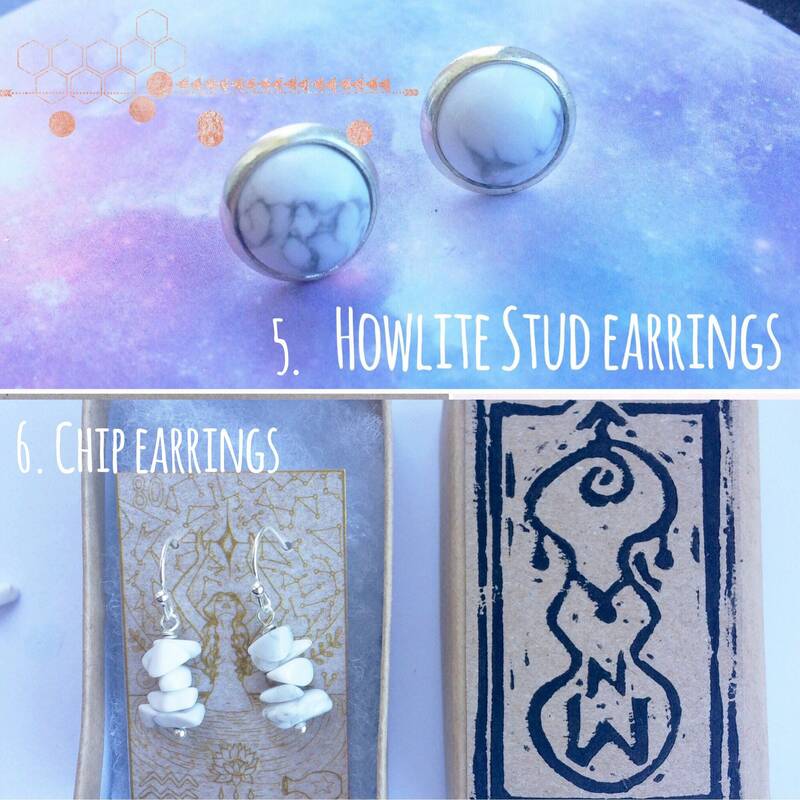 5 - Stud earrings - Silver plated stud earrings with genuine 10mm howlite cabochons. 6 - Drop earrings - 1.8cm drop of howlite gemstones on silver plated French style ear wires. 7 - Howlite chip gemstones on silver plated link chain necklace. Adjustable from 46-51cm. 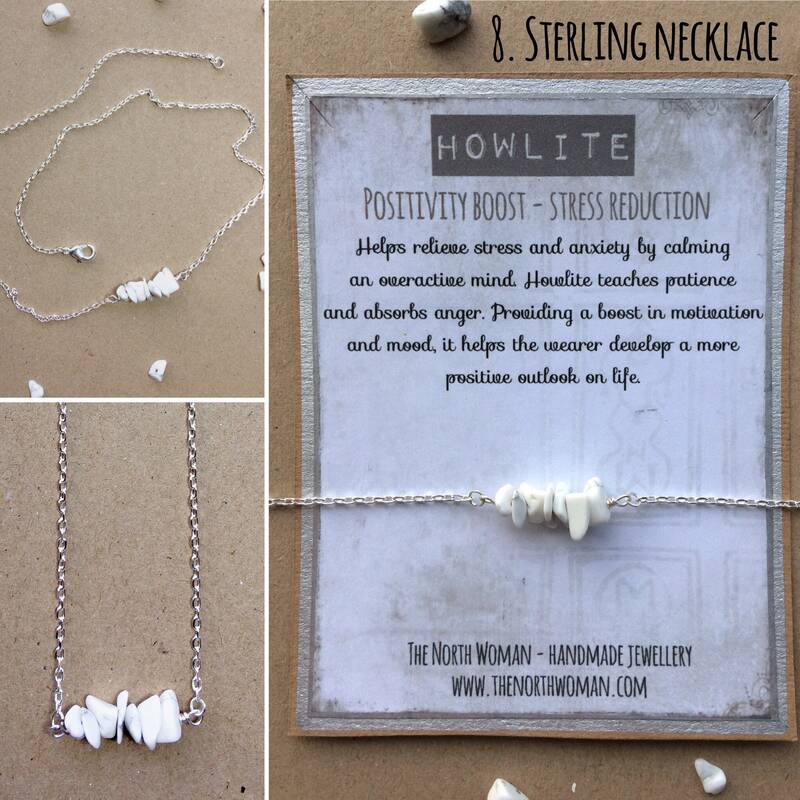 8 - Howlite gemstones on sterling silver chain. Adjustable from 38-43cm. 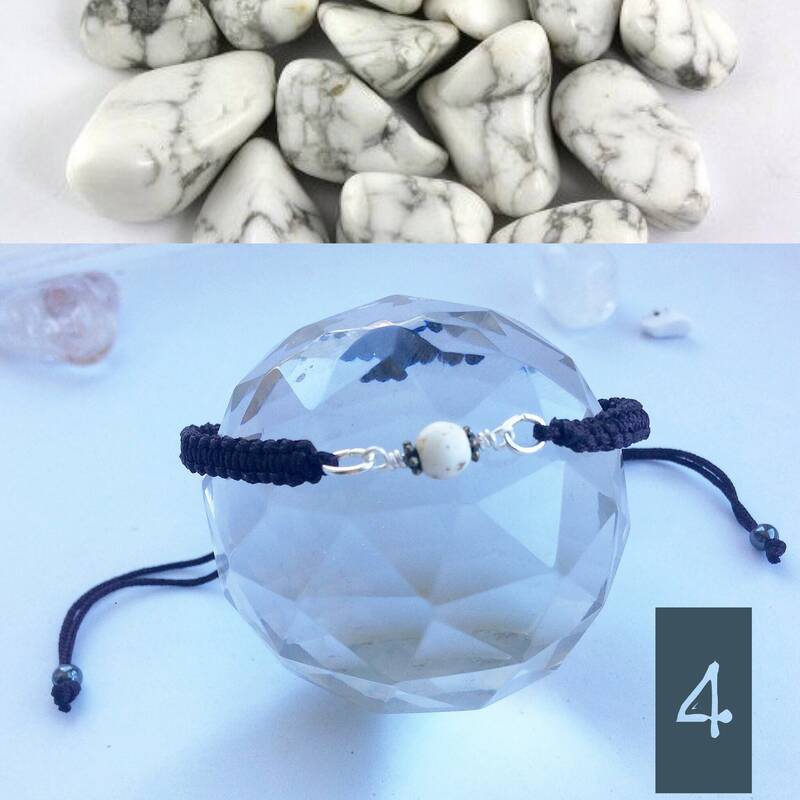 I made a range of holistic healing gemstone bracelets as I am very interested in the properties of these. They are ideal for self-care and also make a thoughtful gift for others. See my shop for collections with amethyst (grief), rose quartz (relationships), blue lace agate (anxiety), fluorite (pain relief), and hematite (confidence).